Are you looking for some tips to get your blog visited by people from the regions of US and UK? This article will make you familiar of some workings tips to get maximum from your blog content by getting great earnings from AdSense. So, go through this article and learn "How to get visitors from US or UK to increase your Adsense earnings". Many of you might be using Google AdSense as the main earning sources for your personal or business blogs and you must be familiar of the fact that the earnings are remarkably high when you get maximum of the visitors from US or UK countries. This is a real fact as the Google AdSense is their local property and when they get the visitors from their locality, the will surely pay you more. So, now the question arises, how to the get the maximum of your blog visits from US or UK. This is the most asked question the blog forums especially by the beginners and the answer to this question lies in this article. Before starting, I might say that there are two categories of the blogger's (on broad level); one that are professional (business class) and the others which are beginners to this job. This class doesn't need such tips or tricks as they help themselves out by other means like the SEO optimizations, quality content, latest happenings etc. these things really boost their blog traffic. Moreover, they can have their contact in the foreign countries especially US and UK and keep any eye on the breaking news and current affairs to post them on their blogs which will automatically catch the eye of the visitors from those regions. Also, being business bloggers, they can advertise their blogs in such countries and eventually attract the visitors from those regions. This really boots up the AdSense CPM and RPM resulting in the tremendous increase in the AdSense earnings. As we all of know that beginners always should start slowly, mind their job and work according to their capacity. I am also a beginner and I am just summing up the things to use them up in my own personal blog in future. While researching a lot on the main source of high AdSense earnings, I got to know about the above mentioned fact. So, I started looking out how I can get the visitors from foreign countries. After a lot of research, I settled down with the fact that the happenings around those regions catch the eyes of that particular regions. So, now the question arise, how is it possible for the beginners to get the information about the latest and breaking happenings across the globe? The solution to this problem lies below. To know about the latest trends in the Google search engine across the globe or a particular region, use the following link. You will find the United States written on the top and default country and below of it showing the latest Google trends (happenings) from that region. The trends include almost every field like technology, politics, economics, culture, sports etc. So, select your topic, get information about it and write down a quality article for your blog with quality language and presentation. 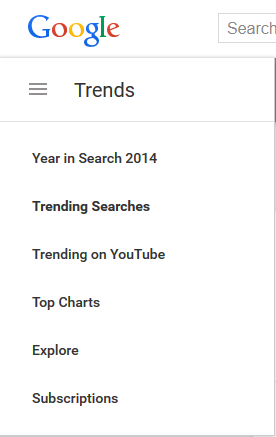 Moreover, you can take the help of menu bar on the top left side of the page like in the image containing the list of trends in 2014, trends in YouTube and much more. That is it. Keep writing quality articles on such trending Google searches and you will surely find your blog gaining more attention from the foreigners and ultimately a boost to your AdSense earnings. There are certain aspects about which you need to be very sure, clear and careful as Google is very sensitive about such practices from any of their publishers. The professionals do not make sauch mistakes but the beginners many a times do. 1)	Never reproduce the content by just rearranging the words or sentences from the other sources. It is true that you have no boss to look upon the things you do but when you apply for an AdSense account, your application is most likely to be rejected. 3)	Do not only concentrate on the foreign visitors. The local visitors are equally as important as the foreigners as the 100% visits from foreign countries can lead to the allegiance of spamming. This was all about how to increase your AdSense earnings by getting the visitors to your blog across the globe. Just follow these tips to maintain high level of your AdSense RPM and CPM to maximize your earnings. This all was my personal experience. I have not started my blog yet but I am likely to imparts these tips in my future work as they are really help and as a beginner, I am getting about 10-20 foreign visits per day to my articles and that is not bad though! Further, if your need any assistance regarding the above matter, feel free to put your queries in the response box below. I will be glad to help you and get advices and suggestion from you too.